It was on the P&O liner Oriana that I discovered Bruce Montgomery. In fact it was quite a coincidence, with three strands coming together at once. Let me explain. The cruise's first ‘leg’ was the long but relaxing journey from Southampton to Barcelona. I spent most of the time eating, reading, swimming in the Riviera pool and listening to a carefully chosen play list of ‘classical’ music on my iPod. An apparently annoying habit I developed was whistling the ‘hornpipe’ as I walked round the promenade deck. But not just any ‘hornpipe’ – it was the catchy version used in that great comedy classic - at least I think so - Carry on Cruising. I could talk for hours about this film. There are so many ‘classic’ lines – "I’ve been up to the sharp end, I‘ve been to the blunt end…" "Italy has nothing to offer me I cannot get here the (the bar!) – break out the Chianti …" etc. etc. Recently, I had been reading an article about detective novels in general and so-called ‘locked room’ mysteries in particular. One of the texts mentioned was a book called The Moving Toyshop by a writer called Edmund Crispin. This was part of my holiday reading. And last, but not least, I included a number of classical music CDs in my listening plan – including a certain Concertino for String Orchestra. It was not part of my plan to make connections – but I did. I soon realised that all three of the above indulgences were written or composed by a remarkable, if somewhat melancholic man called Bruce Montgomery. So the opportunity to review this masterly book by David Whittle was a most welcome, educational and thoroughly enjoyable opportunity. I imagine that relatively few folk will have heard of Bruce Montgomery, yet there will be hardly a person in the United Kingdom who is not acquainted with at least half a dozen of his film scores. I have already alluded to Carry on Cruising – add to this Constable, Nurse, Regardless, Sergeant and Teacher. I can only presume that everybody must respond to a least one of these classic excursions into camp British comedy. But Montgomery did not just compose music for the Carry On films: he provided scores for the equally enjoyable Doctor movies starring the redoubtable Dirk Bogarde and James Robertson Justice. How often do we look for the composer’s name in the credits of a film? I guess rarely. Bruce Montgomery was born in Chesham Bois in 1921. He had a good education both locally and at St John’s College, Oxford. He studied modern languages and subsequently filled the vacant post of organ scholar there – the incumbent had gone off to fight Hitler. Montgomery was inspired to write his first detective novel after reading a book by one of the mid-century doyens of that genre, John Dickson Carr. He was motivated to write The Case of the Gilded Fly in an unbelievably short time, and it was equally speedily published by Victor Gollancz in 1944. It was the first foray of the detective/don Gervase Fen into the criminal complexities of Oxford. Fen, a professor of English Language, was to feature in most of Montgomery’s subsequent crime writings. The detective novels were all written using the pseudonym of Edmund Crispin. It is surprising that nowhere in this book does Whittle suggest that Gervase Fen may have had a profound influence on Colin Dexter and his ‘scholarly policeman’ Inspector Endeavour Morse. Concurrently with his writing, Montgomery was keen to follow a musical career. His early works were small scale piano pieces or anthems. His masterpiece, apparently, is An Oxford Requiem which was commissioned by the Oxford Bach Choir to celebrate the Festival of Britain in 1951. Whittle quotes the Times reviewer as thinking that this "is Montgomery’s most considerable achievement to date; it confirms the suspicion that he is a composer with something of real significance to say." According to Whittle’s evidence and the contemporary reviews, a recording of this work may well be long overdue. It is obvious from reading the musical analyses in this book that Bruce Montgomery was not a major ‘concert hall’ composer. He had only some twenty four works published – most of which was choral or vocal music. However, two key works stand out for me – the above mentioned Concertino (a modest title) and the Overture to a Fairy Tale. In addition there are the attractive Scottish Aubade and the Scottish Lullaby – both re-workings of film scores. But the critical thing is that these four works would be a feather in the cap of any composer – both great and small. They are interesting, well wrought and full of character. In fact, apart from the film music, they represent virtually everything that is recorded and easily available on CD. When Bruce Montgomery turned his hand to the lucrative business of film music, his compositional career really took off. In total, he provided the scores for some forty odd films of greater or lesser importance. Perhaps his greatest achievement was in producing both the music and the screenplay for Raising the Wind – a comical story about music students. Whittle tells the tale that Kenneth Williams and Leslie Phillips were coached on how to conduct Rossini’s William Tell Overture. Furthermore Montgomery himself had a cameo role in this film. Alas, Montgomery had a propensity to fail to meet the strict deadlines that the film producers imposed. This came to a head when the music for Carry on Cruising had to be completed by Eric Rogers. The years after ‘Cruising’ marked a decline in Montgomery’s health and fortunes. Poor health and alcoholism led to long stays in clinics, little work and financial insecurity. He spent the last fifteen years of his life contributing reviews to the Times, editing collections of Science Fiction stories and writing his ninth and last novel, The Glimpses of the Moon. Bruce Montgomery died on 15 September 1978. So the story presented in these pages is not really one of rags to riches or vice versa. It is a survey of a man who struggled with a number of problems – some of his own making and others that were just part of his lot. Montgomery had his moment of fame in the first four decades of his life. The last sixteen or so years seemed to many of his friends to be a let-down, yet Whittle rightly insists that it must "not be allowed to obscure the achievements of his earlier years." Montgomery was successful in four areas: 1) He wrote a deal of concert music. 2) he was a successful film music composer. 3) he had a great reputation as a fiction writer. 4) he contributed considerably to raising the status of science fiction. In addition, he "lived the life of a generous and amusing dilettante socialite." He was intimate with many of the key figures in the literary and musical world. He was most certainly not a failure. I read the analysis of the novel, The Moving Toyshop. Certainly there was much useful and helpful information here that increased my understanding of the book. Yet I wonder if there are ‘plot spoilers’ lurking around here if I had not already read the novel. So I have avoided perusing the detailed studies of the other books and short stories: I do want to read these stories and I do not want to have the plot revealed or even hinted at. I recall an edition of Hound of the Baskervilles where the culprit was actually named and shamed in the introduction! The study of the musical compositions is impressive. The important works are all treated to two or three or more pages of close written text. For example, the fine Concertino for Strings has five pages of detailed discussion complete with some nine helpful musical examples. It is really a model of writing about a relatively unknown work and raising the awareness of the listener. As a matter of fact the Concertino is an extremely impressive work. I imagine that David Whittle will join me in wishing there were many more such pieces as this in the catalogue. It is the sort of number that many have attempted to compose but few have achieved with such great success. It is the balance of tradition with contemporary voice that provides the abiding interest in this composition. Although this balance is perfectly acceptable to listeners, Whittle notices that perhaps his nodding to a bygone age may have been the result of laziness. Montgomery would not work at developing his talents and broadening his stylistic parameters. The author discovers great significance in examining Montgomery’s relationship with ‘famous men.’ I did not know for example that he was close friends with Philip Larkin and Kingsley Amis. The author reveals that he even shared Larkin’s interests in ‘gentleman’s magazines’! These two men did much to encourage the composer when he was sliding into the unproductive phase of his career. Ashgate are making a vital contribution to British Music. A brief look at the rear cover of the present book advertises Alan Bush: A Source Book, William Walton: Music & Literature, The Life and Music of Sir Malcolm Arnold and a study of Thomas Beecham and the Music of Frederick Delius. Admittedly their publications do contain a number of profoundly scholarly books that would not appeal to anyone other than a determined specialist – e.g. Berio Sequenzas: Essays in Performance, Composition and Analysis. Yet a study of the catalogue of this enterprising publisher reveals a commitment to music that is second to none. The Source Books that are published or are forthcoming about Hoddinott, Bush and Ireland are essential reference works for all musicologists – professional and amateur. The present volume feels great, although I guess a ‘glossy’ cover may just have improved the ‘first impression.’ There are a number of excellent photographs and dozens of musical examples. In addition Whittle has quoted extensively from the letters of Larkin, Amis and other key players in the Montgomery story. Separate appendices provide considerable essays on ‘Detective Fiction’ and ‘Film Music’. Obviously, there is a list of compositions – both literary and musical and a brief (necessarily so) discography. Last but not least there is a helpful bibliography. David Whittle has been involved with music from an early age. He was Head Chorister at Peterborough Cathedral and studied music at Nottingham University. It was in his Ph.D. thesis that he first explored the life and music of Bruce Montgomery. At present, he is Director of Music at Leicester Grammar School. Whittle regularly gives organ recitals and is also interested in performing ‘big band’ music. Yet another facet of his musical interest is the harp: he plays with an Irish folk music group in the school. The author enjoys British Music of the 20th century and also has an interest in an earlier age in the 16th century which probably goes with the territory of spending much time in the organ loft. He is currently preparing to write a biography about the author and politician C.P Snow. Whittle is interested in detection fiction – he has contributed to the Oxford Companion to Crime and Mystery Writing. The author told me that he is minded to write a detective story of his own. 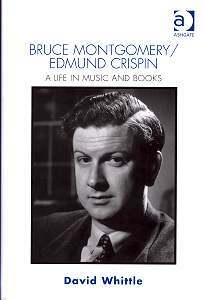 Bruce Montgomery/Edmund Crispin: A Life in Music and Books is a fine volume. It is extensively researched and is written in an approachable style. However, it is a scholarly book and will have a relatively limited market. Notwithstanding, this market will reach out in a number of directions – including students of film and classical music, detective fiction, Philip Larkin and Kingsley Amis.